The Wild Chase Slot Online - Play Free at Slotorama! 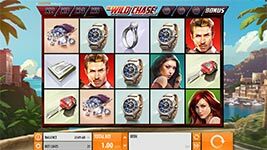 Jump into the fast paced world of The Wild Chase, where any wins are rewarded with re-spins with locked winning symbols. Add to that multiplier Wilds that multiply any win they are included and you have a high-action game that will bring all the thrills you would expect from a Quickspin game. The Wild Chase has 5-reels and 25-paylines of fast-paced action that will have you on the edge of your seat! When you feel like living la dolce vita, sometimes there’s only one way to go about it and it might involve a wild chase for wealth. In this game you’ll be young and carefree amid the blue waters in a Mediterranean bay on the sea, similar to the setting in The Talented Mr. Ripley movie. On the reels you’ll see some fantastic illustrations of characters like two handsome men and two beautiful ladies, as well as a bag of diamonds, a car key, a watch, a diamond ring, a money clip with cash and more. While you can get some decent wins with these symbols, it’s the features in Wild Chase that will really pile up the winnings! Wilds – Each spin in the Free Spins bonus have one guaranteed Multiplier Wild symbol. The Multiplier wild symbol still need to be part of a winning bet line to add to the win multiplier. Free Spins with Guaranteed Wilds – Land three or more Safe Bonus symbols in a single game round to earn 10 free spins. The number of free spin symbols collected is visible in the Bonus meter. Multiplier Wilds – Any multiplier wild symbol that is part of a winning combination awards a multiplier to all wins in that game round. Landing 1, 2, 3 or 4 multiplier wild symbols will win you a 2x, 3x, 4x or 5x multiplier on all wins respectively. Respin Until No More Wins – Any Winning combination triggers the re-spin feature. All winning symbols will lock in their place and the rest of the symbols will respin. Any symbols that add to a winning bet line will be locked and the game respins again giving you the chance to hit more wins!